Today is the 71st anniversary of the first atomic bomb being used against the city of Hiroshima. In an instant ninety percent of the city was destroyed, 80,000 people killed, and tens of thousands more would die of radiation exposure in the weeks, months, and years following the bombing. 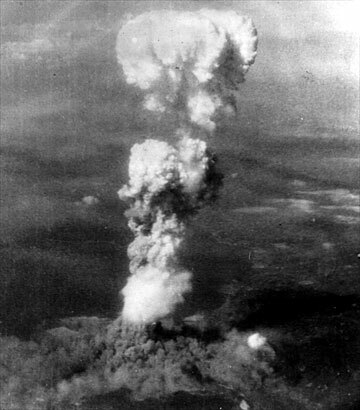 Three days later another atomic bomb was dropped on Nagasaki. In the decades that followed, the United States, the Soviet Union, Britain, France, China, India, Pakistan, probably Israel, and maybe even North Korea have constructed thousands of nuclear weapons, most of them more powerful than the ones used by the United States against Japan. I have always been concerned about the character and temperament of Donald Trump, especially when I think of the possibility of the use of nuclear weapons, Back in the 1980s during the Cold War I was a Nuclear, Biological, and Chemical Defense Officer. I had to learn all about the effects of nuclear weapons on people. I could tell you how many Rads, or the absorbed radiation dose that a soldier could be exposed to and still function. I could tell you how best to survive a nuclear strike, what kind of structure, or vehicle would provided you some amount of protection from radiation exposure. I could tell you how long you could remain in an area where a nuclear blast, or in the case of the Chernobyl meltdown occurred, and I could plot fallout patterns. The maps we used to plot those things in our training included the city that I lived in. I know more about this than I ever wanted to, and those when I hear politicians or for that matter anyone advocating for the use of nuclear weapons, especially as a first strike option, I get concerned. This week, Joe Scarborough of the MSNBC morning show “The Morning Joe” reported that a senior national security policy adviser was asked by Donald Trump “why can’t we use nukes?” three times within less than an hour. When I heard Trump’s acceptance speech, he said that he would defeat the Islamic State “quickly,” even as he derided the U.S. Miltary as a “disaster.” To me that meant only one thing, that he would use nuclear weapons as a first strike option against an enemy that has no capacity to destroy us. The Islamic State is evil, but it is not an existential threat to the United States or any of its allies, thus from an ethical, moral, legal, and military standpoint the use of nuclear weapons would be criminal. When I read Tuchman’s words I can only think about Donald Trump with his finger on the nuclear trigger. Anyway, it is something to seriously ponder. Have a great weekend. I feel that if we elect Hillary, we deserve better…. If we elect Donald, we deserve Donald!